Syracuse is a city in and the county seat of Hamilton County, Kansas, United States. As of the 2010 census, the city population was 1,812. Syracuse was originally called Holidaysburg, and under the latter name founded in 1873. It was renamed Syracuse prior to 1878, after the city of Syracuse, New York. 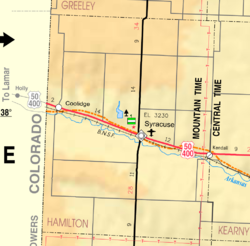 Syracuse is located at 37°58′59″N 101°45′04″W﻿ / ﻿37.982938°N 101.751224°W﻿ / 37.982938; -101.751224 (37.982938, -101.751224), along U.S. Route 50 and the Atchison, Topeka and Santa Fe Railway, sixteen miles (twenty-six kilometers) from the Colorado border. The Arkansas River runs just south of the City of Syracuse. The countryside south of the Arkansas River is marked by sandhills. Located within these sandhills is the "Syracuse Sand Dunes," a city park covering 1,300 acres (5.3 km2), including a 40-acre (160,000 m2) fishing pond. According to the United States Census Bureau, the city has a total area of 4.10 square miles (10.62 km2), all of it land. According to the Köppen Climate Classification system, Syracuse has a semi-arid climate, abbreviated "BSk" on climate maps. As of the census of 2010, there were 1,812 people, 715 households, and 460 families residing in the city. The population density was 442.0 inhabitants per square mile (170.7/km2). There were 832 housing units at an average density of 202.9 per square mile (78.3/km2). The racial makeup of the city was 76.7% White, 0.2% African American, 1.8% Native American, 0.2% Asian, 0.1% Pacific Islander, 19.4% from other races, and 1.6% from two or more races. Hispanic or Latino of any race were 32.7% of the population. There were 715 households of which 37.1% had children under the age of 18 living with them, 51.6% were married couples living together, 9.0% had a female householder with no husband present, 3.8% had a male householder with no wife present, and 35.7% were non-families. 31.5% of all households were made up of individuals and 14.3% had someone living alone who was 65 years of age or older. The average household size was 2.53 and the average family size was 3.23. The median age in the city was 32.1 years. 28.7% of residents were under the age of 18; 9.8% were between the ages of 18 and 24; 25.5% were from 25 to 44; 22.4% were from 45 to 64; and 13.5% were 65 years of age or older. The gender makeup of the city was 50.6% male and 49.4% female. As of the census of 2000, there were 1,824 people, 742 households, and 483 families residing in the city. The population density was 1,374.0 people per square mile (529.5/km2). There were 830 housing units at an average density of 625.2 per square mile (241.0/km2). The racial makeup of the city was 79.22% White, 0.71% African American, 0.27% Native American, 0.82% Asian, 17.65% from other races, and 1.32% from two or more races. Hispanic or Latino of any race were 22.42% of the population. There were 742 households out of which 33.7% had children under the age of 18 living with them, 53.5% were married couples living together, 7.7% had a female householder with no husband present, and 34.9% were non-families. 32.6% of all households were made up of individuals and 17.7% had someone living alone who was 65 years of age or older. The average household size was 2.46 and the average family size was 3.13. In the city, the population was spread out with 29.2% under the age of 18, 7.6% from 18 to 24, 25.5% from 25 to 44, 20.4% from 45 to 64, and 17.2% who were 65 years of age or older. The median age was 36 years. For every 100 females, there were 95.9 males. For every 100 females age 18 and over, there were 90.7 males. The median income for a household in the city was $31,250, and the median income for a family was $37,976. Males had a median income of $29,000 versus $23,482 for females. The per capita income for the city was $15,531. About 10.7% of families and 15.0% of the population were below the poverty line, including 20.0% of those under age 18 and 11.6% of those age 65 or over. Syracuse High School is the unified high school for Hamilton County USD 494. The Syracuse school mascot is Bulldogs. Northrup Theater in downtown Syracuse. Mural of cavalry soldier (1991). Syracuse High School Bulldog mascot. ^ Kansas State Historical Society (1916). Biennial Report of the Board of Directors of the Kansas State Historical Society. Kansas State Printing Plant. p. 201. ^ "Profile for Syracuse, Kansas". ePodunk. Retrieved 11 June 2014. ^ "USD 494 Syracuse". USD 494. Retrieved 8 January 2017. Wikimedia Commons has media related to Syracuse, Kansas. This page was last edited on 23 March 2019, at 16:50 (UTC).